Cooped up in his room with a leg in plaster cast, L.B. Jeffries observes the everyday lives of those who inhabit the apartment opposite. What starts as idle interest slowly lurches into creeping suspicion, as Jeffries believes one of these neighbours has murdered his wife. After enlisting the help of both his nurse and girlfriend, Jeffries must try and convince an old war buddy/ detective that foul play has occurred, stirring up a hornet’s nest and potentially putting those he cares about in jeopardy in the process. Masterfully handled by a true artist of suspense cinema, Rear Window takes a simple premise and seemingly effortlessly draws the audience into the mindset of its protagonist. The casual observation of the lives of others over a scorching hot summer leaves James Stewart’s Jeffires with suspicions and uncertainties, and as the drama slowly unfurls, we are dealt with the same emotional response. What did we actually see? Is there likely to be a rational explanation? Was this gruesome act real or imagined? We never truly know until the final reel’s thrilling conclusion. Jimmy Stewart handles the bored composure of L.B. Jeffries in a manner that is both relatable in his inquisitiveness and his stubbornness. From his leg itching beneath the cast, to his curious eyes always being drawn to the window, it’s as though he’s looking for an escape from the dreary, languidness of the stifling summer haze. There’s a morbidity that develops as his mind wanders which over time, manages to affect his nurse, Stella (Thelma Ritter) and his doting, socialite girlfriend Lisa Freemont (Grace Kelly). Ritter is a canny whirlwind of humerous thoughts and philosophies, while Grace Kelly glides through every scene with charm and poise. Watching Lisa’s interplay with Jeffires is heart-achingly troubling at times as Stewart seems particularly adept at playing the aloof, would-be-bachelor a little too well, in reaction to Kelly’s tender advances and playfulness. The most impressive aspect overall has to be that this (possible) murder mystery only plays out within Jeffires’ room and what he can see through his rear window. Each neighbour or tenement houses a unique set of individuals, from the lonely lush, to the newlyweds, the limber ballerina, to the lone songwriter in the studio room. The building’s residents become part of the living organism and we are as fascinated observing them as Jeffires becomes from the confines of his living quarters. 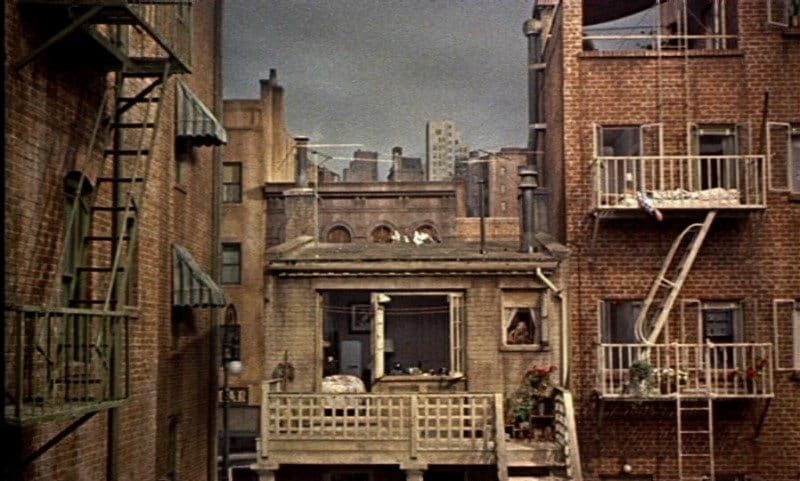 One of my favourite Hitchcock movies, Rear Window is an absolute joy. Come for the twists and turns, stay for the chemistry between Stewart and Kelly. If you’ve not had the fortune to catch this before I can’t recommend Rear Window highly enough. Regular type person by day, film vigilante by night. Spent years as a 35mm projectionist (he got taller) and now he gets to watch and wax lyrical about all manner of motion pictures. Daryl has got a soft spot for naff Horror and he’d consider Anime to be his kryptonite.